I'm not sure how I didn't smell this happening since I was 6' from the printer. I noticed that my print cooling fan was blowing on the nozzle enough to drop the extruder temps below the set temperature; the bed temperature was also well below the set point. I'm guessing that the fan is blowing far to hard and caused the nozzle and bed heaters to run for too long. The printer never did stop printing and the print turned out great. Looks like I have a fire hazard that I need to clean up before doing anything else though. In the firmware, there is a option to turn on Thermal Runaway protection. I highly recommend it, it could save you from a devastating fire (like what could have happened in that photo). Keep in mind, it is a double-edged sword. It will shut down the printer of it can't keep the temps up on the hot end and bed, (you set the time/temp deviations allowed). Here's how it works: You set the temp of the bed or nozzle to 100/240 (ABS) for example. The printer heats up, starts printing, and something happens to the thermisor (like it fails, or falls off the hot end, and it starts reporting a cooler temp. Standard firmware will keep the heater on full bast, trying to get back to temp. If this goes on too long, thermal runaway protection kicks in, and for safety, shuts down the printer. Now if something did go wrong, you've saved your printer and anything around it from potential damage. Here's where it cuts two ways: If nothing went wrong, but rather a fan kicks on to cause the drop in temp, you've ruined a print. (This has happened to me a few times). Also, if you change the temp, and it takes too long to get to that change... Same thing, it thinks there's a problem and shuts the printer down. This happened to me this weekend. I was printing with WoodFil, and read that raising the temp 15-20 degrees can darken the print, so I was experimenting with changing the temp cooler/hotter/cooler/hotter to get wood-grain type of striations in the print. Well, when it set the hotter nozzle temp (from 205 up to 225) it took to long for the nozzle to get to 225, and the printer shut down. Arrg! So, understand what you are getting with Thermal Runaway protection. I still think it's worth it. For the couple of you who have mentioned issues with the Z height, the stock firmware Folger tech has on their site has the Z steps set wrong. They should be (with a stock setup) 4000, not the 3840 or whatever it is. That's probably the issue you have been seeing. BTW, this thread is dying. I used to come here daily, but it's been several days. There's a very active FT Facebook group (almost 2000 members). A significant portion of the posts are related to the new FT-5, but still lots of 2020 i3 owners (like me) over there, and you'll usually get answers to questions within minutes, not hours or more. > BTW, this thread is dying. Dying after 174 pages doesn't seem so bad. This must be one of the longest threads on the forum, and it's been amazingly helpful and constructive throughout. I can't speak for anyone else, but for me the FT 2020 was a stepping stone. I learned a ton about building, using and modifying 3D printers from it, and then eventually moved on to a new one (Eclips3D). The FT 2020 now sits lonely and neglexted under a table. Yes, it's dying because 2 other groups have formed. One on FB and the other is a self standing site. The FB site is getting just as convoluted and hard to follow as this one was for me when I started with my 2020 i3. I read every page and every post and it helped me tremendously. The new FB site is more of a show and tell and a fight to see who is the biggest expert, if you know what I mean. A lot of bum dope with some very good info interspersed. You just need to put the BS filter on. My second printer is the FT-5 and, after some modifications to level, shim, and align things, it works great! I'm in the process of making it easier to swap a volcano in and out when needed. I'll miss this thread though. I was a little late starting with this thread because I got my 2020 last April. I think I read every post twice and because of all the support here I never had any real problems. Since then using information I found here I built a second 2020 with Sonny upgrades for X, Y and Z along with the E3D hot end, and the new i3 MK2 hot bed (some day I will take a picture and post it). From my view just about anything you would need to know for support or upgrades has already been covered here. There is nothing wrong with anyone new starting with this printer because you can get great results for a low entry cost. But like others I am now working on an FT-5 and wish there was a thread as good as this on for that printer but all the things I learned here are helping. Thanks for the tip Andrew, I'll definitely look into the thermal runaway protection. I don't generally leave the printer unsupervised but more protection could save me from having to replace parts which sounds like a good trade off. I have a number of personal issues and security related concerns about Facebook, it seems like an odd platform to have a discussion about an open source printer. Maybe it's time to take another look. I'm having a ton of fun with this printer, learning a tremendous amount and getting far better results than I thought would be possible. This thread has been a priceless resource so I'll certainly keep up with it. I still use mine but it barely has anything left from its original form. I would be interested in how many of these they are still selling. I am thinking the decreased traffic is also because the kit is old. On the Facebook group I mostly see FT5 stuff. 10 mins later "Oh crap!" I soldered straight to the board and put car fuses inline between board and powersupply on hots, jumped where the polyfuses used to be..
A la Ramps 1.4.2 [www.reprap.org] , but with more wires and questionable decisions. Edited 2 time(s). Last edit at 10/08/2016 03:25AM by VonRansak. I have the new RAMPS board installed and everything working well again. I'm playing with the thermal runaway protection, it's definitely touchy but a good idea in the long run I think. It's surprising how quickly the bed temps drop when the fan comes on, I've had to reduce it to 40% output max and it's disabled for the first 10 layers now, otherwise the bed temp drops like a rock. I have been leery about those green connectors. The strip 1/8" of wire is bs, at least 1 wire falls out weekly with maybe 6 prints. 3/16 to 1/4" seems to be much better. I am still trying to get my 2020 tuned. I have 2 adobe'ed ( not quite bricked) megas, and must remove the 3rd on to do firmware changes. The megas work but.are not seen as com ports by arduino ide. The printer can be controlled and the ide reads the mega info, just will not program them.They will not program on other computers and are the megas from Folgertech. They programmed in the printer once for the latest one with a problem, and probably 6x for the other one. Did you tin the wires before inserting them into the green connectors? No, I didn't tin them. Tinning the wires is considered to be a bad idea. See [forums.reprap.org]. The best approach is to crimp a ferrule on to the end. 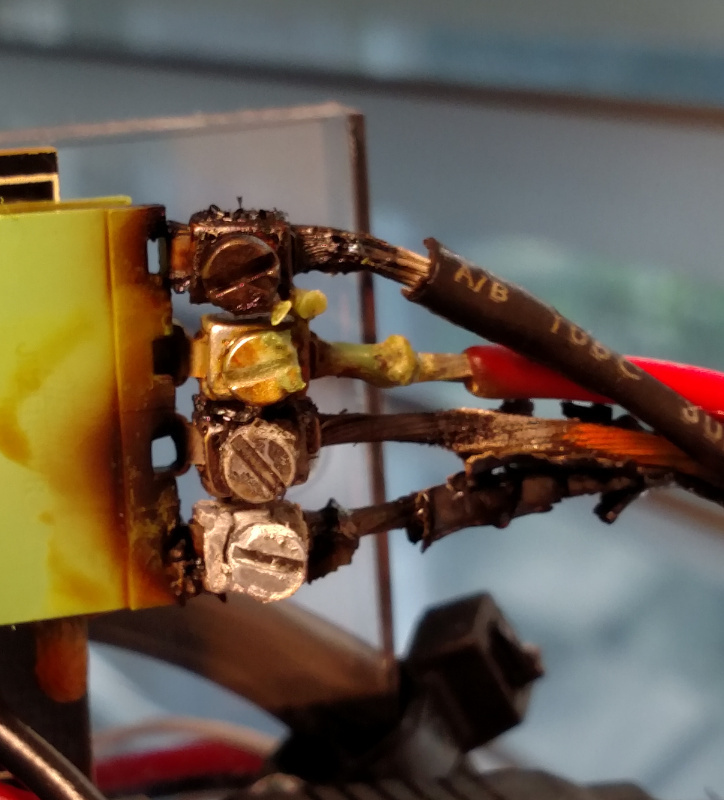 I've never had any problems with this myself, though I was fortunate to catch a bad connection by noticing a smell from the insulation (which was starting to melt) and a very hot connector. That's why I asked, animoose. Anyone have a version of Marlin 1.1.0-RC7 configured for our stock printers? Or optimized? Seeking to buy/build a Prusa i3-ish printer. I see this one has quite a following. Would this still be a recommended printer for a person new to printing in general? Is this akin to the original or the MK2? Sorry for the remedial questions. I started reading the thread but at 174 pages it just might take me a minute. I would not say this kit is in the same league as the original prusa kit. When I got it I looked at it like it's cheap and I get something that will work that I can upgrade as the funds allow. I don't have one but the Prusa kit appears something you would buy if you just want it to work and not tinker around. So, i was looking at making my 2020 Prusa i3 printer quieter and thought about buying/swapping one of the X/Z motors (which are silent) for the Y bed motor (which is noisy as fck). I can't even hear my X carriage moving back and forth but i can hear the Y moving from halfway across the house lol. Other than the torque rating, is there really any other difference between these motors? p.s. I have played with the voltages, its just a loud motor compared to the silent smaller motors (gives off a lot vibration with a loud but typical mechanical hum. I've ran it for over a year now so I don't think anything is really wrong with it. Maybe I can find a motor that has a similar torque but is quieter like my x/z motors. To make mine quiet I replaced the Y axis with v-slot, replaced the power supply with an ATX one, and a different fan on the cool block. Got a weird problem with the 12864 display. I had an issue on my Ramps board the connector with the power going to it to overheat and the connector was starting to melt and turn black. That caused the fuse to blow on my power supply. At the time, I thought it was more than just a fuse so I replaced the entire power supply with a new one along with a new Ramps board. Since that time, everything works correctly except for the rotary knob on the display. If I push the button, I do get a beep, but it will not change the display and turning it will not change the menus. It really doesn't do more than beep. I'm still able to print from the computer, but getting things setup is a pain. I have several Mega's and Ramps board and have tried a few different combinations without any change including a new display board. I'm leaning towards just replacing all of the electronics at once, but would rather not if I can avoid it. My Folgertech 2020 has been a trusty beast printing multiple spooles of plastic for me... But finally my extruder/hotend/temp reader is failing. Its a long overdue upgrade at this point... Any good reccomendations for all in one replacement on a budget? I don't want to buy junk though. If it costs more so be it... Im looking to print PLA/ABS/Ninjaflex/PETG/Nylon all the good stuff. Any reccomendatinos? I can have some friends of mine print me an extruder if thats the best option... Not looking for a bunch of fiddling around though. I have noticed the stock mounting for the extruder motor is just the worst. Tons of wiggle and the screws strip easily.... Even with red loctite. Ill probably replace the extruder carriage and motor to. Any reccomendations? Edited 2 time(s). Last edit at 11/18/2016 09:09PM by UltiFix. Edited 1 time(s). Last edit at 11/19/2016 12:07AM by UltiFix. If you want to print Ninjafex surely you would be better sticking to a direct drive extruder? Yes i have been using bowden for some time, and get excellent result. I have heard of how some people have issues with retraction settings, but all of my prints are 100 to 99.9 percent string free. Also, Supermec is right in that direct drives are much easier for printing flex material, but it is very possible to get good prints using flex materials and a proper bowden setup. Congratz on working bowden setup, gotta be nice and light man! I think im going to go with E3D Titan with a Nema 17 pancake motor and a E3D v6 lite. Its super light so has the advantages of a bowden but without the setup hassle. Edited 1 time(s). Last edit at 11/20/2016 01:56AM by UltiFix. I just ordered one of these printers with the Folgertech black Friday coupon. I'm looking forward to receiving it and starting the build. I'm a manufacturing engineer by trade, and an very comfortable with assembling things, so I'm not expecting to have issues with the build. But, I know that the are always little things that pop up here and there. What drew me to this kit specifically was the price, and the fact that the 2020 aluminum frame will be really easy to modify and expand over time. My plan is to use this kit as a starting point and gradually improve it and enlarge it as time goes on. I'm looking forward to building it myself to really get an understanding of the system, so when it comes time to upgrade and make changes, I'll know the system in and out. Before I get started, are there any recommendations of items to get before I start the build, or things to watch out for to address during the build? Just looking to avoid any stumbling blocks or extra trips to the hardware store mid build. I think it is an excellent kit to get started with, as it will produce decent quality prints without modification, and you can use it as a base for iterating and improving it. My Folger 2020 went through several major changes before I moved on from it to a CoreXY design, and I'm really happy that I started with it. As regards what you will need, the kit is quite complete. For tools, make sure you have some metric Allen keys. A multimeter is useful but not essential. You might consider getting some white lithium grease for for bearings, though again this isn't essential. Things to watch out for: be careful when putting the bearings on the rods, as it's really easy to damage them. I recommend a visual inspection of the RAMPS board as soon as you unpack it, as some of the are not well made (solder bridges, flux not cleaned off the board), so if you need to replace it you can nag folger straight way rather than have to do it when you are at the moment of using it. The same probably goes for all the parts: inspect them as you unpack them. I personally didn't have problems with any of the other parts. Unfortunately this forum has been quiet recently, but a few of us do read it now and again. There is also a folger group on facebook, and a wiki at [folgertech.wikia.com]. Thanks for the info. I had actually seen your blog before, and I've bookmarked it for reference when I build mine. My kit shipped today, so I will receive it next week. I'm looking forward to getting it going. I'm lucky to have the access to 3D printers at work. I've not had a chance to actually get hands on with a printer yet, but I have designed many parts and have had them printed over the past year. We even have a 1 meter x 1 meter x 500ish mm printer that I've had the opportunity to use quite a bit. I've printed some big objects on that (200+ hour prints), and I've also used it to do large batches of smaller parts. I find that once you start printing things, you find more and more applications to print new things. The biggest thing that appealed to me with the 2020 frame was the ability to increase the print area rather easily. I've already got a list of mods planned out. Relocate Z motors for extra travel, auto leveling, LCD with SD card reader, new hot end and possibly a bowden extruder. It should be fun to tinker around with. Edited 1 time(s). Last edit at 12/02/2016 08:28PM by markag. Got my kit in today. Everything seems to be in order. My boards don't look too bad, but I did have a question on the arduino board in the image. It seems like I might have a solder bridge, but it also looks like it might be intentional. Looking for some input there. I also noticed my hot end is not square relative to the extruder. Question is, should I care? How do I fix it? I've never seen a picture of a 3D printer with it turned like that before. Other then that, it looks like folgertech has switched to 5kg stepper motors across the board now. The package references older motor torque ratings, but lists all X, Y , & Z motors as 5kg motors. I'm assuming this is a good thing. Any input on the board would be helpful. Thanks. Edited 1 time(s). Last edit at 12/05/2016 09:26PM by markag.